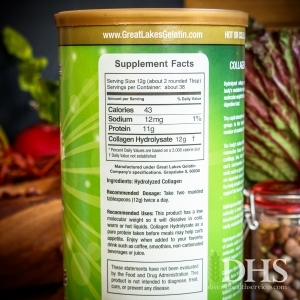 Great Lakes Collagen Hydrolysate differs from regular gelatin because it will dissolve in cold, warm, or hot liquids and will not congeal when chilled. 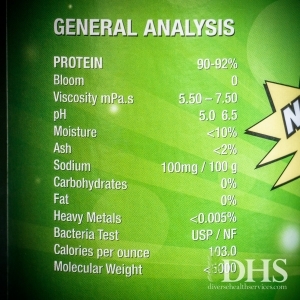 This enables you to take a high protein product in a convenient way that suits your needs. 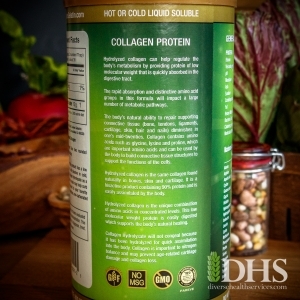 Collagen Hydrolysate is also more quickly assimilated into the body than regular gelatin, and greatly improves hydration to the connective tissues. 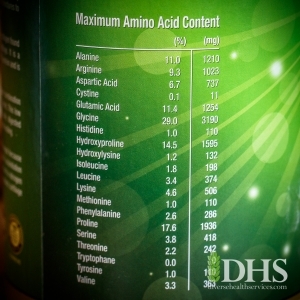 It has higher amounts of the amino acids glycine, lysine, and proline, which are particularly beneficial to cell growth and reproduction. Simply stir right into cold or warm liquids without clumping or causing the liquid to congeal. A great way to get an extra boost of gelatin without having to make anything special out of it! It can also be used to add extra richness to homemade broths and gravies. Stir directly into coffee, milk, tea, juice, smoothies, yogurt, etc. Kosher. No MSG. Gluten free.